At the moment, T is learning his numbers, not saying them, he's been able to do that for ages and now does simple addition and subtraction too, we're now learning to recognise numbers and associate those numbers to values. I'm always looking for a quick recycle project and if I can create one that helps T with his learning, all the better! 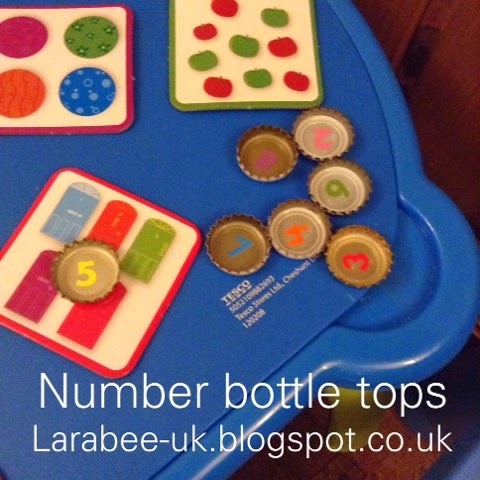 For this quick project I used regular beer bottle tops, it goes without saying that this isn't really suitable for small children because there can be sharp edges but there was a reason I wanted to use these instead of milk bottle tops. 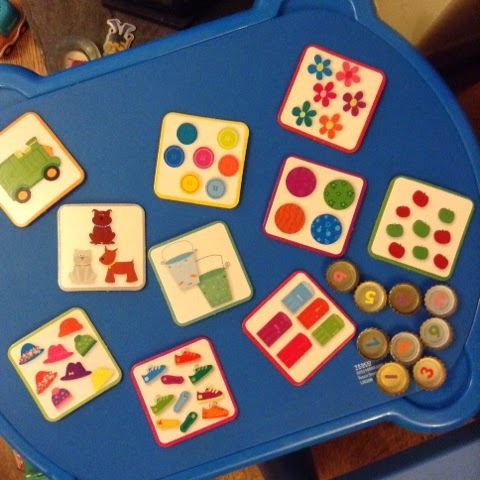 I used the number stickers from our fab Easter #kidsstickerswap sponsor stickerstocker.com they are great value at £1 including a pocket reward chart! What a bargain, and they offer 10% off of your first order and... There is a huge sale on right now, so head on over and grab some bargains (this isn't part of our 'deal' I just think they are great!) I'm going to be placing an order for some educational toys soon! I have this idea in my head to extend this game and use a magnet 'fishing line' to fish for numbers and then match them up, which is why it's useful they are beer bottle tops and not plastic ones! Do you have any great ways to teach children numbers, I'd love some tips if you have some! Great idea. Need to do more number stuff with Youngest. What a great idea.!!. These kind of activities must be thought to toddlers,these kind of activities encourages kids to learn and understand things better.